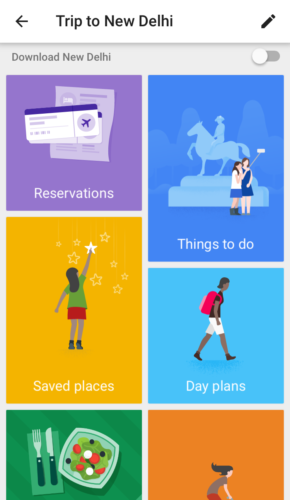 Google Trips is a new app that allows you to easily plan and execute a trip. It wraps almost everything you’d need into one app—from your reservations, to sights descriptions, to directions for getting around. The app even provides important information about a destination like tipping cultures, health tips, and what to do in en emergencies. I am planning a trip to New Delhi right now, and I am falling in love with the app already. If you use Gmail, the app directly pulls reservation details from your inbox. This includes flight details, confirmation codes, addresses, and phone numbers. The app also works offline, so the information will be with you wherever you go. This could be especially handy if you are abroad and may not have internet access. But perhaps the most exiting feature is “Day Plans.” The app will show you a few suggested trips around your city, with different themes. For example, in New Delhi there is one for Central Delhi, one for South Delhi, and other ones that cater to kids or those who are into markets. Other than curated day trips, you can also make your own. You can create a morning, afternoon, or full day trip, and even specify the day of the week you will be visiting. Since Google has information about a lot of sights and restaurants, they will be able to plan something while accounting for opening times. Clicking on the “Magic Wand” automatically generates a new route. You can also create your own trip, and clicking on the magic wand icon generates a new one. This is an awesome feature that takes advantage of everything Google knows about a city. It combines the prowess of Google Maps with knowledge about specific sights, and you can even check user reviews where available. In just a few minutes, I already have a draft of what I could do in one day. I usually use TripAdvisor for a lot of my planning, since I’ve found the crowd-sourced suggestions and ratings reliable. I don’t see that changing any time soon, but Google Trips is a handy new tool to quickly put together a draft itinerary. I am excited to see how it works in practice for my upcoming trip! Looks like there aren’t to many happy users of this app. I don’t see the day plan menu. Where do you see that?